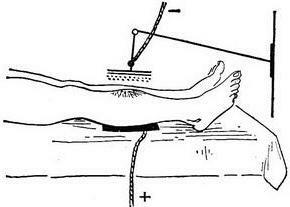 Franklinization is a method of electrotherapy, which the body is exposed to a constant electric field of high voltage. If franklinization have the effect of a constant electric field, the light air ions, ozone and nitrogen oxides formed as a result of "quiet" category. Fig. 1. General franklinization - electrostatic shower (unit AF-2). Mechanism of action - see Electrotherapy. Franklinization is used by the following methods. 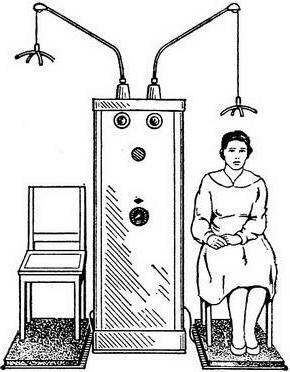 In General the effect of electrostatic soul - patient sits on a wooden chair, putting legs on a metal electrode connected to one of the poles of the device. Rubber footwear thus remove, and hair pockets and remove all metal objects. Head over to the patient at a distance of 12-15 cm hung second electrode with sharp points (Fig. 1)connected more to the negative pole. Maximum voltage 40-60 kV; procedures are performed daily duration 10 - 15 minutes, up to 12-15 per course of treatment. When reflexosegmental or local impact of pre-discharge capacitors, then the electrode appropriate size with the blade set against the area being affected (Fig. 2)at a distance of 5-10 cm from it. The second electrode is placed on the opposite surface of the body; voltage 10-20 square Wounds and ulcers exposed to during bandaging for 15 minutes, up to 10 - 15 procedures for treatment; impact on the region of mammary glands 5-8 min, the treatment course 8-10 procedures. Indications: functional disturbance of nervous system (neurasthenia), hypertension, bronchial asthma, lack of milk (hypogalactia) lactating women, slowly healing wounds, trophic ulcers, neurodermatitis. For carrying out of franklinization use devices AF-2 (can be performed simultaneously by two patients), and AF-3, the kit which includes a spherical electrode for group ionization (see Aeroionotherapy). Contraindications - see Electra treatment. Apparatus for franklinization set so that at a distance of 1.5 m from it was not grounded objects.